It’s never easy to put a blog on hold, but we know we’re not the first ones to do it. We’ve decided to put Monsters in My Backyard on an indefinite hiatus; there are too many other projects that also want our attention, and we don’t want to hack out these posts. Thank you so much for reading the updates and enjoying the art we’ve posted; you can continue to catch some of Wes’s sketches on his Instagram page. Yo! Deadlines call, so we’re taking this week off. Thanks for your understanding! Compared to Venus flytraps, which clamp their jaw-like leaves around flies and other small, wriggly bits of prey, the various pitcher plants in existence must seem like pretty benign carnivores. Their way of capturing prey strikes me as a bit like windmill fighting: can they help it if juicy insects and ripe-looking amphibians happen to tumble into the pits of digestive enzymes waiting at the bottom of their pitcher-shaped leaves? In fact, pitcher plants don’t consume every organism that ends up in the pit. Some of those organisms actually help pitcher plants process the other creatures they’re about to eat, somewhat like parents who cut their children’s food for them, though slightly more savage. 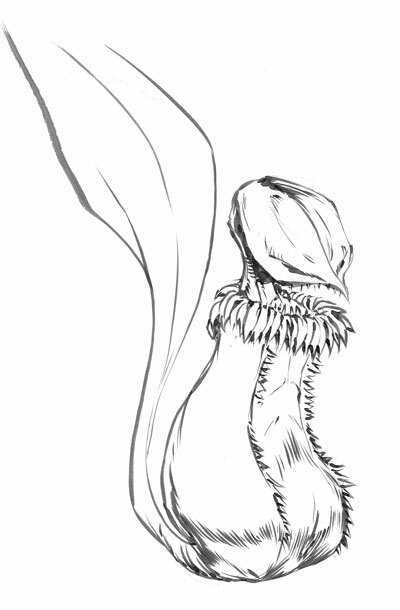 Nepenthes is a genus of pitcher plant found primarily in the southeast Pacific. Each leaf starts with a thin tendril at the tip, then inflates like a long balloon until finally, at maturity, a flap of leaf material at the tip opens, and a pitcher is formed. Pitchers in general are excellent for holding liquid, and those belonging to the plants of genus Nepenthes are no exception, though the sweet, attractive nectar and the digestive enzymes that they produce differ substantially from the iced tea you might pour yourself on a hot summer day. As effective as the digestive juices that Nepenthes make (capable, in some species, of taking out entire mice) are, the digestion process can always stand to go more quickly. Some Nepenthes have tiny hollow chambers in their stems where ants can make their homes. Instead of falling into the pitchers, the ants snag other insects attracted by the nectar. The ants are sloppy eaters, which is a good thing for Nepenthes, as the stray insect crumbs slip into the pitcher and get digested much sooner than an entire insect would. So some ants and some pitcher plants make good matches. Others, not so much. Sarracenia is another genus of pitcher plant; some of its member species grow from the grounds of peat bogs in North America (including Illinois’ own Volo Bog). A Sarracenia‘s pitcher looks different from that of a Nepenthes, in part thanks to a flange running the length of the leaf that creates a stream of nectar. Ants climb the leaf and follow the trail, which leads to the edge of the long, tall pit, and—whoops, in they go. That’s not to say that Sarracenia species can’t play nicely with others. The larvae of some insects, such as the blowfly, live inside the pitcher and feed on partially digested remains, while bacteria in the water that also collects in the bottom of the pitcher help get that digestion going in the first place. Though they pose a threat to some living creatures, pitcher plants hardly are isolated organisms, at least within a habitat. In the case of Nepenthes, our evolutionary tree suggests otherwise, as Nepenthes are believed to exist much in the same form that they have for millions of years. In other words, the Nepenthes genus has no close relatives. That’s okay, little pitcher plants. At least the ants seem content keeping you company. Some caterpillars possess amazing defense mechanisms, the kind that exist to make parents and guardians forever fretful when their kids go out to play. Other caterpillars mimic bird poop. I guess the phrase “different strokes for different folks” applies to the non-folks of the animal kingdom as well. The photo that inspired today’s post. Caterpillars are the larval forms of both moths and butterflies, squishy little worm-like creatures that emerge from eggs. Their squishiness makes them incredibly attractive to several members of the animal kingdom including birds and squirrels that, like me around midnight, are always on the lookout for a snack that’s easy to eat. So to become a bit more difficult to eat, several species’ caterpillars have evolved features along their bodies that discourage other animals from poking at them, usually through the always discouraging use of toxic chemicals. The larval forms of such frequent flyers as the Io Moth, the Buck Moth, and the Hag Moth all have bodies lined with stinging hairs and quills that are connected to poison sacs. These hairs can break skin, allowing the toxic chemical to seep beneath them. Humans who get stung by these caterpillars may experience symptoms ranging from minor irritation to everybody’s favorite, intestinal discomfort. Given how most people feel about having a churning sensation in their lower abdomens, it’s understandable that a lot of people avoid touching caterpillars just to be on the safe side. The majority of caterpillars are not stinging caterpillars, though. Unlike the stinging caterpillars listed above, others have bumps on their bodies that appear harmful but really are just for show. One such caterpillar is the Black Swallowtail. During some of its larval stages (and larval stages are called instars, in case you were wondering, since science has names for everything), the Black Swallowtail’s body is lined with orange bumps that protrude from the surface. They look dangerous, because often in nature red and orange are used as colors that warn predators that they’re hunting something that will seriously screw them up, but Black Swallowtail caterpillars are considered by some people one of the best caterpillars for budding entomologists to try to raise. 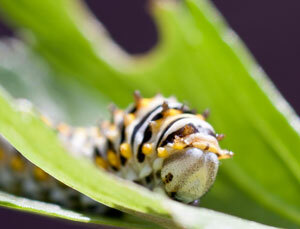 So how do Black Swallowtail larvae stay safe? Well, they do have one protrusion that actually does mess with other animals. 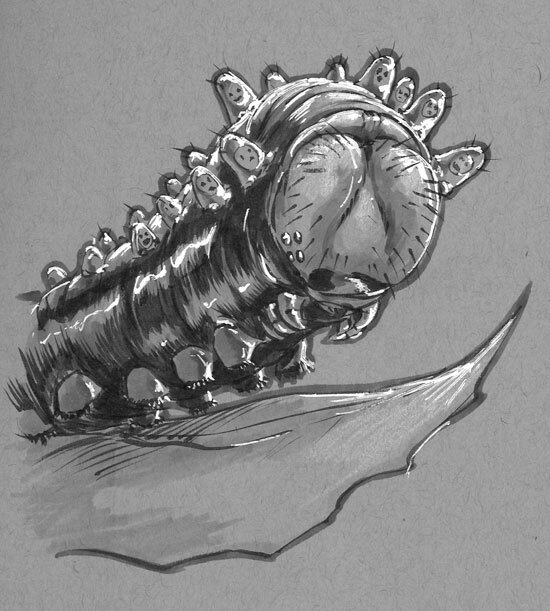 It’s called an osmeterium, and it’s a Y-shaped horn located at the back of the caterpillar’s head that pops out when the little squirmster is frightened and gets retracted when it once again feels safe. The osmeterium shoots a musty-smelling liquid that, while not harmful to humans, is tinged with a distinct whiff of eau du displeasure, enough to suggest that backing away is a good idea. But before the osmeterium even comes into play, the Black Swallowtail caterpillar defends itself in another way: similar to the Tiger Swallowtail caterpillar, during its earlier instars, its body bears a splotchy white marking right in the middle. Does this white mark carry the same suggestion of poison that red body markings do? Nope. Does it make the caterpillar look like an unappetizing piece of bird poop that squirrels and other animals are likely to pass over without a second thought? It sure does! No one ever said that survival can’t be crappy sometimes. I use witch hazel extract on my face every night. It’s derived from the leaves and bark of the common witch hazel plant, Hamamelis virginiana, and in addition to cleaning the skin is supposed to help relieve it of irritation. In light of witch hazel’s calming properties, I guess it’s a little funny that a witch hazel plant starts out, very literally, with a bang. The photo that inspired this post. That last option probably sounds made-up. It isn’t. Witch hazel seeds develop inside of a capsule that bursts at maturity. Like a circus daredevil spewed from a cannon, each seed ends up shot about twenty to thirty feet away from the parent plant. The capsule makes a popping sound upon bursting—or a bang, to go back to where we started this. It’s nothing like the method of seed dispersal that many trees here in the Midwest employ. Wind dispersal seems more appropriate for a plant that’s used to make a soothing extract. The way that whirlybirds or helicopter seeds like the ones seen in the photo above (the technical term for a winged seed like these is a samara, presumably because “whirlybird” never stuck in scientific circles) simply flutter to the ground perhaps offers a greater sense of enchantment than the botanical equivalent of cannon fire. 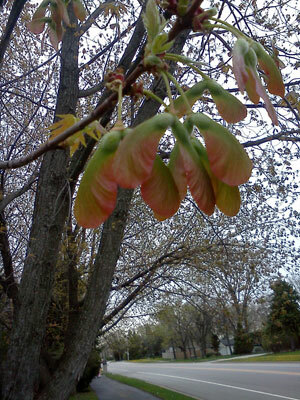 Plus, as mentioned before, all the other plants are doing it: various trees including ashes, the winged elm (naturally), and most conspicuously maples all produce winged seeds. Not every seed is guaranteed to land somewhere hospitable and grow, so the parent plant spends a lot of energy producing seeds that will never germinate. In order to be light enough to dance on the spring breeze, winged seeds aren’t packed with as much nourishment as, say, the seeds packed into fruits are. As a result, some will be too poorly nourished by the time they land to sprout. Kids like to pick them up and toss them into the air, at least where I grew up, because it looks really neat (see trade-off #1). No doubt that witch hazel’s exploding seed pod looks (and sounds) neat, too, but the exchange there is that it takes even more energy than making a load of winged seeds to actively expel a few seeds from one’s body. 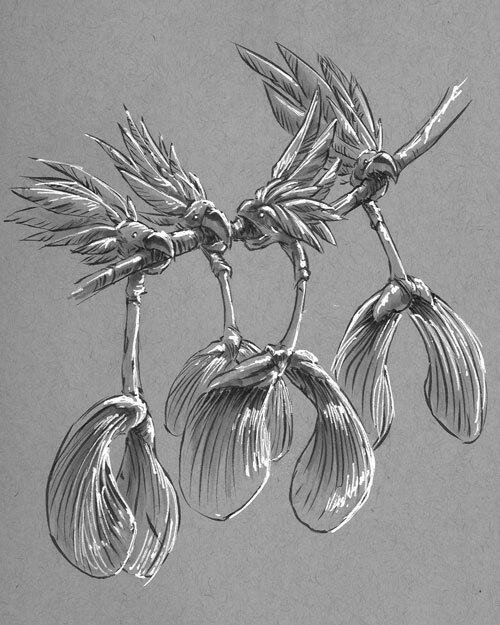 Each plant evolves the method of seed dispersal best suited to its environment. If it happens to delight us with showers of whirlygigs or sudden eruptions of seed pods, well, that’s just one more way we’ve benefited from evolution, I’d say. It’s right up there with opposable thumbs in scientists’ minds, I’m sure.